Throughout this month I'll be doing a series of articles on Bergman and his films. I hope you'll keep up and join in the discussion. I've heard it said that Ingmar Bergman's films are no longer as relevant as they once were, which is as dispiriting a statement of modern culture (and especially modern cinephilia) as I've ever heard. And, for someone like me, who not only worships Bergman but is ready, a little too willing, and hopefully able to defend classic cinema to the death, it's practically a rallying cry. My fascination with Bergman began with a single image, and ironically it wasn't precisely one from his films, but rather the portion used by The Criterion Collection for their glorious Fanny and Alexander box set. It was to this image that I attached all manner of hopes and aspirations and aesthetic concerns. I'd wander the aisles of Newbury Comics, a frequent haunt for me and my college chums, occasionally picking up this box set, turning it over, constructing the film I imagined it to be, which as it happened, turned out very differently than the film it actually was. I started watching Bergman aspirationally, I'll freely admit that, and what he and his films gave me was something far beyond what I ever imagined within the walls of Newbury Comics. He gave me a personal vision of faith and spirituality that I'd never heard and only suspected might exist, one driven by an ongoing struggle with the otherworldly that was nevertheless grounded in very real, human concerns. The Fanny and Alexander I imagined was much different from what I actually saw, and what you'll have the opportunity to actually see if you live in the Los Angeles area. The Aero Theatre in Santa Monica is holding a four-day, seven-film retrospective over the first week of March, featuring some of Bergman's very best films. Of particular interest to me is the double feature of Wild Strawberries and Persona, my two absolute favorite Bergman films, and two films that are near ends of the spectrum across which Bergman ran, on March 8th. 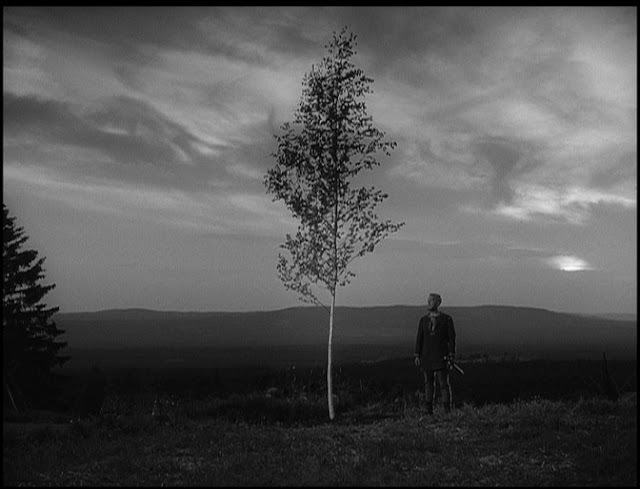 Aside from some dream sequences, Wild Strawberries is a pleasant, surprisingly warm treat, often very funny, displaying a nostalgia much more common to his early work, but with the experience of diving straight through his own soul in The Seventh Seal, made the year before, already behind him. While much of his early work involved emotional repercussions of direct confrontation, Wild Strawberries is really about the burden of what isn't said, and how we attempt to overcome the vast accumulation of that. That the Aero put it on a double bill with Persona (pictured above) is all kinds of fascinating, but will provide a very rewarding evening for all involved. 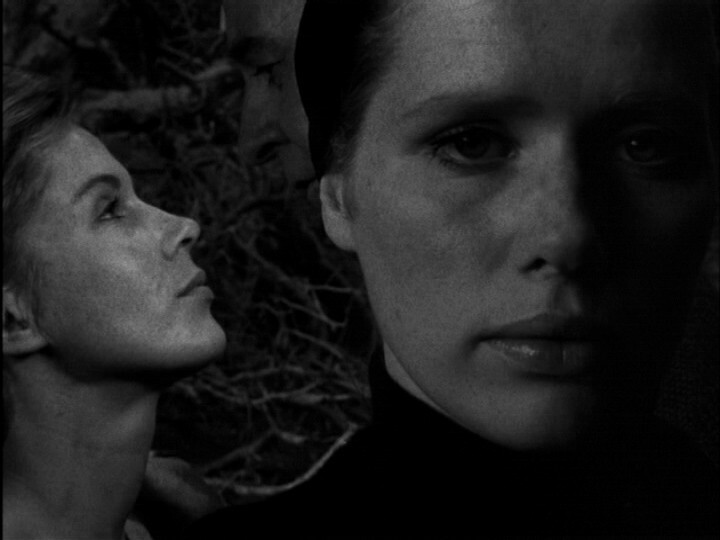 Persona is Bergman at once at his most radical and most direct. As with many of his films, it became the archetype of a certain flavor of the "European art film" that would go on to be mocked, parodied, and imitated for decades (hell, (500) Days of Summer did TWO Bergman parodies), but if one can shut out the post-modernist noise, what's onscreen is still one of the most emotionally harrowing experiences the cinema has to offer. At times sensual, at others tragic, always mysterious, Persona uses an intriguing shell - a young nurse (the beautiful Bibi Andersson) is assigned to care for an actress (Liv Ullmann, in the first of her many collaborations with Bergman) who, for whatever reason, refuses to speak, at an isolated summer house on an island - to get at questions of identity, memory, repression, guilt, reality, and the medium of film itself, but refuses to settle on answers. As another writer put it, "I don't understand this movie. I don't have to." Wild Strawberries and Persona show at 7:30pm on March 8th. But let's go back to the beginning. On March 1st at 7:30pm, they'll be showing The Virgin Spring and Hour of the Wolf. The former won Bergman his first Oscar in the foreign language category (he'd win twice more, and be nominated another nine, including notices for direction, screenplay, and picture, a feat unthinkable for a foreign language film in the modern awards environment), and would go on to inspire a Wes Craven horror film over a decade later. It's also the rare film that Bergman directed, but did not write, working instead from a very fine screenplay by Ula Isaksson. Working in the tradition of parable that Bergman often flirted with, but rarely engaged with so directly, The Virgin Spring is also the kind of film that draws narrative tension from an unsuspecting audience, so I'll simply say that its engagement with themes of revenge and morality in a religious context are deeply felt and thoroughly examined in astonishingly brief running time (like most Bergman films, it runs under 100 minutes). The ending still retains the power to devastate. Hour of the Wolf is one of Bergman's few headfirst dives into surrealism and horror, even as its emotional terrain is not so different from Persona or Shame (not playing at the Aero, but well worth checking out). Liv Ullmann stars as a woman whose husband (Max von Sydow) is encountering increasingly horrific visions, which he believes to be demons. The manner in which Bergman navigates the horror is exceptional on levels both thematic and aesthetic, directly confronting the imagery as often as he teases it, and it becomes painfully clear that much of what we see is directly tied to Bergman's own consciousness (not that this is an unfamiliar phenomenon in his work). The next night will be the first I'll attend (I'll be seeing a Robert Bresson double feature at LACMA on the 1st), when the Aero will present one of Bergman's most indelible works - Cries and Whispers. This is the film in the series I've seen least recently (only once in the fall of 2007), so I cannot recall specifics, but on a pure aesthetic level, this really, truly demands a big-screen experience. Unleashing bold, assaultive reds in a film about a dying woman (Harriet Andersson) and her two sisters (Ullmann and Ingrid Thulin) who have come to care for her, this is in many ways Bergman's most direct confrontation with death, both in the horror of facing it directly and the appreciation of life it inevitably engenders. While The Seventh Seal saw Bergman question mortality on an intellectual level, this is the work of a man who has seen all his fears realized, and is deeply thankful to have emerged on the other side. The film they've paired with it, Autumn Sonata, is not a favorite of mine, though your mileage may vary and at the very least, the chance to see Cries and Whispers on the big screen is well worth the price of admission alone. Sonata does boast the only collaboration between Bergman and Ingrid Bergman (star of Casablanca, to whom Ingmar was not related), and her final performance. She plays a concert pianist who comes to stay with her daughter (Ullmann again), to whom she has not been the most attentive mother. Ingrid Bergman gives an amazing performance, far different from her screen persona of the 40s and 50s, but I've always felt Ullmann was perhaps too fragile and the dramatic strategies Ingmar Bergman employs are very forced, even for him. Still, as always, he digs at some issues rarely explored onscreen, and if you're there for Cries and Whispers already (and why wouldn't you be), another 90 minutes ain't much to spare. 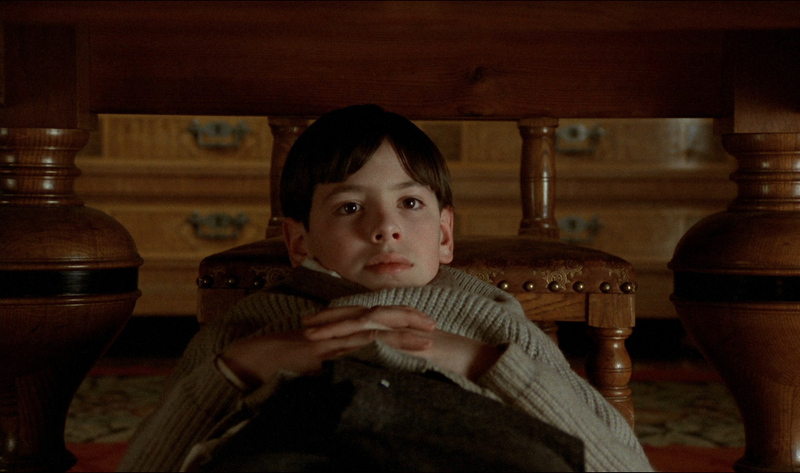 On Sunday, March 4th, they'll be showing a film I've only kind of seen - 1982's Fanny and Alexander. Now let's make no mistake, I've SEEN the five-hour cut of Fanny and Alexander three times with my complete and undivided attention. I LOVE the five-hour cut to an extent that is almost incommunicable. 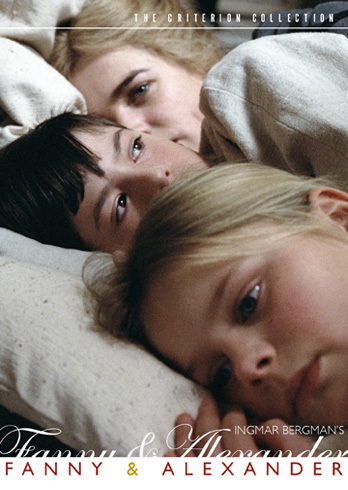 No other Bergman film gives me as total joy as it, though, concerning as it does the rather harsh circumstances in which its titular characters (children, at that) are raised, it is not a thoroughly joyful experience. It is Bergman's most directly autobiographical film, and its liberties from his own upbringing are as telling as the tangible realities, but it's the perspective he lends it that makes it truly special. Bergman was in his sixties when he made it, but few other films understand and appreciate a child's point-of-view as he does here. The world is still one in which magic lingers at the edges for Alexander, though the unknowable is still as frightening as it is intriguing, and his emotional navigation through a life determined by others is so honest and pure I tend to well up just thinking about it. I've never actually seen the three-hour theatrical cut, which is what the Aero is showing at 7:30pm that day, and could not speak to its effect, but should it be half the film its five-hour version is, its power is incomparable. As Bergman's principle preoccupation was the notion of some supernatural force outside of the tangible aspects of life (or "God," though his concern was not always so specific), I wonder if the reason Bergman's films lack relevance (rather, a perceived relevance) is that the debate on God is more or less settled. Atheism and agnosticism are no longer considered radical or exotic standpoints; if anything, religion is now considered the outlying belief of the culturally educated person (i.e. the kind of person who would be most likely watch Bergman's films). The idea of grappling with the idea of God and His teachings, never mind religion, is so far removed from our culture. One either believes, or one does not. Either one are "fine," though each side tends to approach the other suspiciously, and religion is one of those topics you simply don't talk about, least of all seriously, and least of all with people with whom you disagree. It's not polite. Or maybe it's just that they're damned hard films to watch, I don't know. I'm not going to lie and say Cries and Whispers or Persona are terribly entertaining, and certainly not easy, but then again, I would hate to pay and spend time exclusively with "easy" experiences. I certainly find them intellectually and emotionally exhilarating, so there's that, and I can nearly guarantee that any honest encounter, free of the irony or self-awareness that accompanies so much of modern culture, with an Ingmar Bergman film will leave you in some way changed. One cannot be numb to such experiences, lest one cease to truly live. Bergman was overrated in the 50s and 60s, though not by much. But he's been seriously underrated since the 80s, a real pity. I think even Bergman detractors recognize PERSONA as a great film. But WILD STRAWBERRIES, beautiful as it is, is too pat and neat in in its meanings and symbolism. No doubt, a lot of thought and labor went into it, but it's all there to be 'read' and understood, leaving little in the way of lingering mystery. It's a film that invites thought but eventually--even all too easily--lends itself to interpretation. Like Fellini's LA STRADA, once the dots are connected, you get pretty much the picture and meaning. In contrast, our thought processes and imaginative speculations are never exhausted with films like VERTIGO, MURIEL, ALPHAVILLE, ANDREI RUBLEV, VAMPYR, and etc. They offer another angle, another reality with every viewing. And they defy and transcend the necessarily restrictive categories such as 'art' and 'entertainment'. I totally agree, but Wild Strawberries is such a finely-crafted piece of drama that its closed-off nature doesn't bother me at all. In general, I do respond more to the "speculative" films like the ones you mentioned, so Wild Strawberries is a bit of an anomaly for me, and I hope to explore it further after seeing it again (it's been...four years I guess since my last viewing).